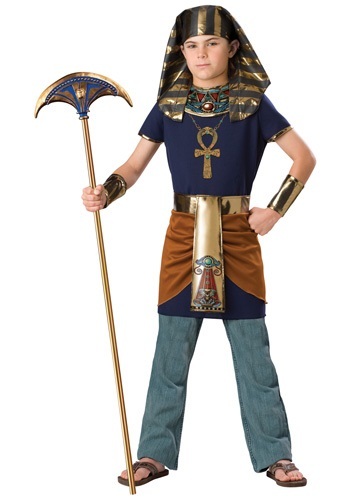 King Tutankhamen was the youngest, and last, of the Pharaohs of Egypt, and he wore clothes very much like this Child Pharaoh Costume! 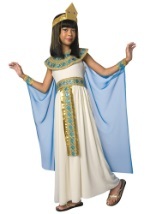 It includes a tunic, headpiece, gold lamé collar and wrist cuffs, and a belt with attached drape. The thigh-length tunic is navy blue woven poly poplin with short sleeves and round neckline, with a Velcro™ dot closure at the back of the neck. 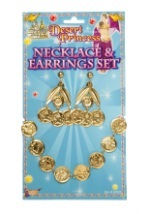 Its front is printed with the image of a gold Ankh on a neck chain. The belt is gold lamé and fastens in back with Velcro™. It has hanging side panels of brown poly interlock knit, and a front drape of gold lamé printed with the image of a cobra and an all-seeing eye. The circular gold lamé collar fastens at the back with Velcro™ and is printed with colorful geometric figures. The gold lamé wrist cuffs also fasten with Velcro™. The headpiece is gold lamé printed with black stripes. It is reinforced at the forehead so it will stand upright, and there is an elastic band that fastens behind the head. 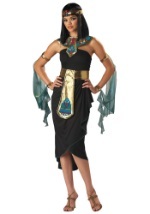 The side flaps of the headpiece can then be draped as desired. This is quality fit for a king!